I still remember the day I brought my sweet baby Gus home. It's been many years but it's as fresh as if it were yesterday. I held in my arms this beautiful, fat angel of a puppy. I couldn't comprehend how quickly time would fly by. Everywhere we went together. Memories upon memories were made. You were my "once in a lifetime" dog. Always happy, tail wagging, plenty of wet sloppy kisses, whether I was gone for 10 hours or 10 minutes. You were my gentle good natured boy. You took care of me, you took care of the house when I wasn't home, You learned to care for and guide your blind dog-brother Jack. For you the best things in life were free - a car ride with the top down, a long hike on a sunny spring day, some mud to roll in and of course a good belly rub at the end of a long day. I now I remember the day I came home without you. I remember the ride to the vet and telling you it would all be better soon. I held you, my beautiful, fat angel...for the last time. You went to sleep in my arms and just like that, my time with you was over. In the blink of an eye, 10 years went by, but your memory will be with me forever. I was blessed to have shared that time with you. You will be forever remembered - forever missed. Love you my sweet baby Gus. Hi Bonnie. 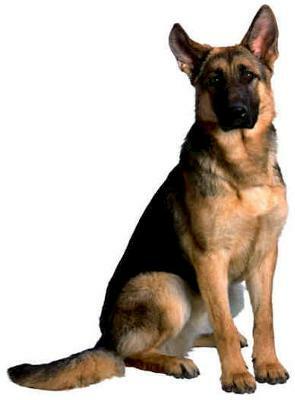 Thank you so much for sharing your story about your German Shepherd Dog , Gus, with us all. I am so very sorry for your loss. What a wonderful dog your Gus was. It is so hard to lose a wonderful pet but your memories will help you through it all and as you have shown us all, your memories will stay with you forever.